In the world of Granite Countertops Atlanta residents have a distinct advantage over everyone else. That’s because the Granite Countertop needs of Atlanta, Marietta, Woodstock, Roswell, Alpharetta, Dunwoody, Buckhead, and the surrounding areas are being served with excellence by All South Granite & Marble. Specializing in Custom Granite Countertops Atlanta based All South Granite & Marble has the experience, the creative artistry, the skilled craftsmen, the state-of-the-art equipment, and the tremendous inventory of natural stone slabs to design, deliver, and install the granite countertops, marble countertops, natural stone fireplace surrounds, and natural stone tile of your dreams. The biggest thing that differentiates us from our competition is our ability to create nearly invisible seams between slabs. It’s truly something you have to see to believe, so do yourself a favor and schedule a visit to our showroom to have a look. Plus our line of products and services goes beyond just Granite Countertops and natural stone products. 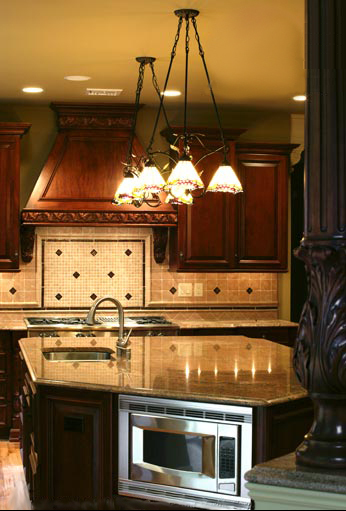 We are the turn key provider for every step of your kitchen remodeling project or bathroom remodeling project. As a distributor of premium plumbing fixtures like IPT Sinks, Artisan Sinks, Huntington Brass Faucets, and more, All South Granite & Marble is able to perfectly integrate the design, shaping, and installation of the stone countertop with the setup, fitting, and connection of the sink and plumbing. So everything goes in together and our crew insures a precise fit and proper functioning before the masterpiece is complete. And just like we custom tailor our Granite Countertops, All South Granite & Marble will work with you to custom tailor the elements of your kitchen and bath remodeling that you want us to handle. Depending on your wishes, we can reconnect your old faucet and garbage disposal, reconnect all stoves and cook-tops, design & install your tile backsplash, put down tile floors or hardwood floors, coordinate the running of electricity and under-cabinet lighting, and that’s just the beginning. Tell us about your dream kitchen or dream bathroom and we’ll make it a reality. All over Atlanta Granite Countertops are proof of our ability to work magic with granite and marble. The natural stones that we use, Granite, Marble, Limestone, Travertine, Caesarstone, and Silestone, have been waiting under the soil for millions of years, developing their intricate and beautiful patterns. Let us combine your vision with the skills of our expert craftsmen, the advanced technology of our tools, and the breathtaking beauty of this magnificent natural resource to give you the best granite countertops Atlanta has ever seen. Call or email All South Granite & Marble today to learn more about granite countertops and to start the process of making your dream a reality.